Meet the next generation of the GoPro action camera. Called the Hero4 Session, this new camera is the first major redesign of the company’s ubiquitous camera since the original Digital Hero launched in 2007. But it’s not just a pretty new face. This camera is a significant step forward for GoPro . This is the first GoPro that doesn’t need a case to survive extreme activities. The smaller size comes with concessions. The camera lacks the 4k recording capability found in GoPro’s high-end models. The battery is also not replaceable or swappable. Yet the camera still hits a sweet spot. The Hero4 Session is the best GoPro yet. The Hero4 Session took GoPro three years to build and develop. After spending just a few minutes with the new camera, it’s clear this is the future of GoPro. 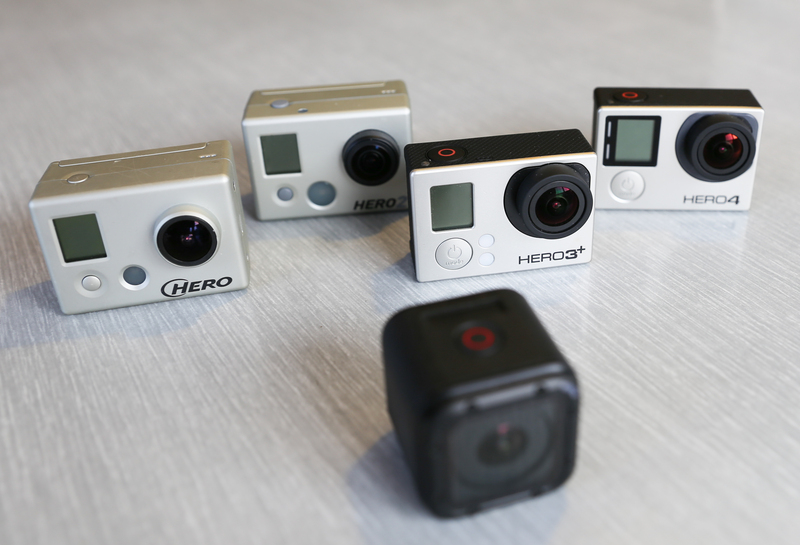 The Hero4 Session features several distant advantages over its counterparts. First, it doesn’t need a case to be waterproof or shockproof. This is key. Other GoPro cameras require various cases and accessories to survive a dip in the pool or a bounce on the floor. The Session waterproof to 10 meters. The Session detects its mounting orientation and automatically rotates the video. Since it’s a cube, GoPro wisely built a system that allows the camera to be rotated in its mounting frames while always recording the video as if it was right side up. Throw it on the bottom of a car or drone or skateboard and it will record as if it was mounted right side up. The Session lacks a replaceable battery but makes up for it with smart power controls. Hit the top button to turn the camera on and the camera starts recording. Hit the button again and the camera stops recording and turns off. This simple change in the power scheme reduces the amount of time the camera sits idling. Previous GoPro cameras featured a power button and a seperate record button. On the Session a single button handles both duties, giving GoPro the freedom to implement a more logical control scheme. Lastly, the Session has a top mounted LCD status screen. It’s tiny. And that’s okay. The small screen displays the camera’s mode, battery life, and connection status. 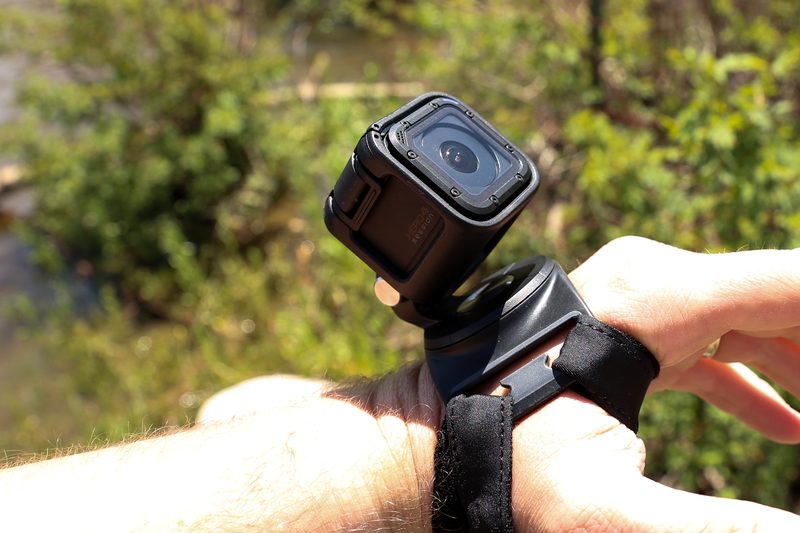 But the top-mounted location is far-superior to the front-mounted screen found on other GoPro cameras. That said, the tiny screen is limited to just a few functions and forces owners to use the GoPro smartphone app to change general camera settings. The GoPro Hero4 Session mounted to The Strap, GoPro’s latest mount designed to work with the Session and all other GoPro cameras. This is the easiest to use GoPro yet. And that’s important. This is the easiest to use GoPro yet. And that’s important. GoPro cameras have always been a bit convoluted. The buttons were never labeled and are easily confused. Many of my GoPro videos often start with an unintentional selfie, captured as I accidentally start recording while hitting the wrong button as I try to change a setting. This doesn’t happen with the Session. On top of the Session is a single large button with a red circle. Press this button to power on the camera and start recording. It’s that simple. A smaller button is located on the backside that, when pressed, lights up the LCD display to change modes and check the life of the battery. These two buttons are clearly differentiated and cannot be confused. The Session’s button layout clearly states GoPro is striving to make their cameras easier to use. And that’s exactly what the firm needs to do. If GoPro is going to continue to battle smartphones, the cameras need to be easier and more intuitive. Video quality is on par with other GoPro cameras. The Session lacks the ultra-high definition and high-speed captures modes found in the $500 Hero4 Black camera. Not having 4k is okay by me, but during my time with the Session, I missed the capability of recording high frame rates at a full high-def resolution. The Session tops out at 60 fps at 1080p and that doesn’t cut it for slow-mo videos. While the Session cannot record in 4k, the video quality is perfectly fine for high-definition viewing. Most users will be perfectly happy with the 1440p30 or 1080p60 recording capability of this new GoPro. The low light recording is acceptable and like every other GoPro, the camera easily captures fast-moving objects. Yet this step backwards in video quality feels lackluster. At $400 the Session is not cheap. It lives in the higher-end of GoPro’s range, and therefore should have similar video recording capabilities. Even though the Session’s video quality is good enough, for $400, I want it to be better than good enough. GoPro sacrificed on-camera setting changes by reducing the size of the LCD screen. This requires owners to connect their camera to a smartphone or GoPro wireless remote to change items like video capture resolution, frame rate or enable GoPro’s ProTune system that lets owners specify white balance and the like. At first this felt odd as GoPros have always featured on-camera controls. Yet using a smartphone to change these settings is so much easier anyway. I would rather have a smaller GoPro camera that’s easier to control than a GoPro camera with a mess of confusing buttons. Once upon a time, GoPro sold a single action camera. Along the way the company kept adding more models to hit different price points. Now, with the Session, GoPro sells five cameras. The Session lives in the upper echelon of the range. It sits at the same price as the LCD-equipped Hero4 Silver and just $100 less than the 4k-capable Hero4 Black. The Session comes packaged with two mounting frames, two mounts, and redesigned mounting buckles that are more diminutive than previous GoPro buckles.